Nothing says spring time like asparagus. On this Memorial Day weekend, technically spring, but the unofficial calendar start of summer, the recipe for French Fridays with Dorie is Asparagus Soup. In New England, Asparagus season has just begun, so this choice was perfectly seasonal. Two years ago, we relocated (uh, I mean restarted) our asparagus bed in a sunnier location. The trees near the original bed had grown and converted the lighting from sunny to part-shade. With a new asparagus bed, you let most of the stalks grow untouched for a few years, so we only cut half a dozen spears, hardly enough for this soup, but enough to enjoy in a pasta salad. I LOVE asparagus! I don’t eat it much off-season, but in late May and June, when it’s in its prime, I can’t get enough of it. I found this recipe to be a bit fussy, so I tried to simplify it, or at least make it work for me. For example, I’ll be honest. I’ve never been an asparagus peeler. I don’t quite get why this step is often recommended, or even necessary. The only hiccup I’ve experienced with asparagus is when I don’t cut off enough of the woody ends and it’s unchewable, but I’ve never found the peel to be a problem. But, I’m open to learning something new, so I set out to peel the asparagus, two and a half pounds of it. Truth be told, I gave up after 5 stalks. That left me without the peelings to make the quick stock base from. I took a different tactic. I put the woody ends, and the dark green tops of my leeks, plus the peelings of five stalks of asparagus right into a pot (no wrapping in a cheesecloth, another fussy step), covered them with salted water, and boiled it for a few minutes. Then, I strained out the solids. The asparagus stalks themselves needed a quick cook too, so I brought the stock to a boil again and cooked the asparagus as the recipe called for. From there, I followed the recipe as written. When I pureed the soup in the blender, it came out perfectly smooth, so again, I still don’t understand about the peeling step. I served the soup hot in small bowls. I forgot to buy cream, so we ate it plain. It tasted like the essence of asparagus. I might make this again if I come into a bumper crop of asparagus, though it’s unlikely I can be convinced of to peel any of it. To see how the other Doristas’ thought about their bowls of green, check out their links here. We don’t post the recipes, but you can find it in Dorie Greenspan’s book Around My French Table. To my US compatriots, Happy Memorial Day. As much as we use this day to mark the start of summer, we should also take time to remember and be thankful for those who’ve been lost serving our country. I hope you have a safe holiday weekend! 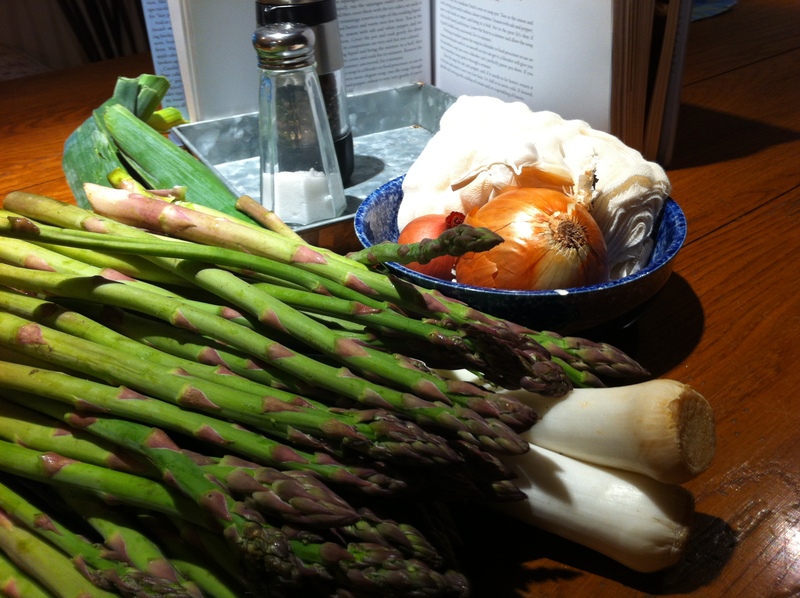 Posted on 24 May 2013, in French Fridays with Dorie, Soup, Spring and tagged asparagus, French Fridays with Dorie, soup. Bookmark the permalink. 17 Comments. Your soup looks great! I, too, found the peeling step to be both tedious and (probably) unnecessary. Unlike you, however, I peeled every bloody stalk. I at least had the foresight to snap the woody ends off first, so I didn’t have to peel them, too. I really liked this soup, although it was a tad underseasoned until I added a bit of cayenne pepper. I’m about to go back for my third bowl, so I guess that says something. I’m with you Betsy, not a peeler and don’t understand why it needs to be peeled. 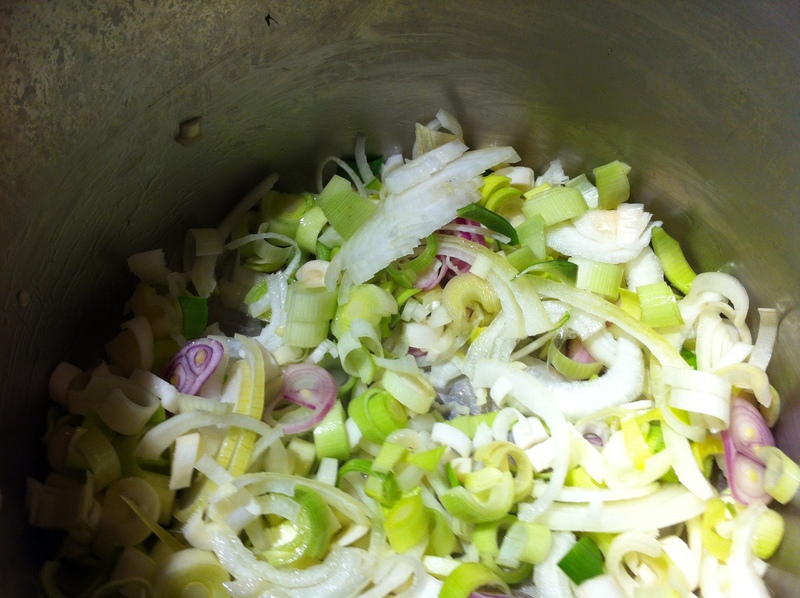 Your soup is a beautiful shad of green. Thanks for checking on me! I didn’t peel my asparagus either, but found the end result a bit “woody”. So I had to pass it through a tamis. I’m glad you enjoyed your soup. I thought mine needed a bit more kick. I like your shortcut! It took forever to peel all the slender stalks of the asparagus I had. Have a lovely long weekend! Oh, and I just wanted to mention that I’d just finished an Everlasting Harvest before last week’s post – I must have been unconsciously channelling Adler! 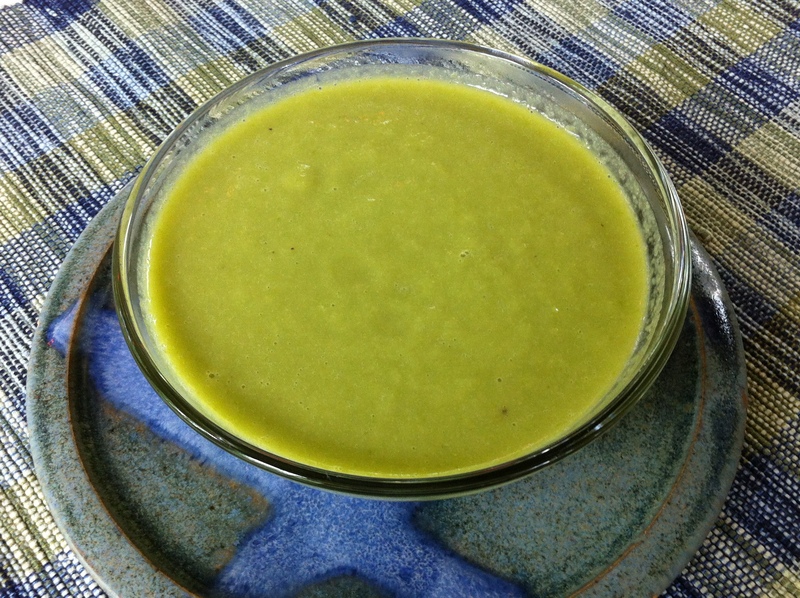 Betsy, what a beautiful green color your velvety asparagus soup has – it really does look delicious and it is nice to read that you enjoyed this lovely soup! People always think that I am rather strange because I consider peeling asparagus as having meditative qualities, I actually enjoy it – I guess any excuse to disappear into the kitchen is fine. I don’t normally peel asparagus either. Your doup looks great. Enjoy your long weekend. I love asparagus season too! I don’t normally peel asparagus either, but I did for this soup. It helped that I only made half the recipe. Your soup looks beautiful! I did not peel my asparagus at all and can attest to the fact that “unfussy” prep worked just as well in this recipe! Perfectly delicious looking soup. We all enjoyed this recipe and will definitely do it again. Enjoy your Memorial Day weekend, hopefully it will warm up a bit. I’m so with you! No peeling here! I just break off the ends since they naturally break where the tender part starts. I simplified the method too – but this was pretty tasty. I served mine hot with some home made corn muffins. I’ll have the rest cold – when I tasted it, I liked it better. Hope your weekend is(was) nice!! I think there is a consensus among the Doristas that we are revolting against peeling asparagus stalks. I gave that up years ago after peeling three stalks of the stuff. Why? I just threw the woody ends into the cheesecloth but wish I’d thrown in the leek tailing, etc. My broth was tasty but may go with vegetable or chicken broth next time. I also just pureed the soup in my processor, no straining, and thought it was delicious. How can you ruin asparagus soup? The stuff is marvelous, especially with creme fraiche or sour cream. Try that next time, Betsy. I’ve never successfully grown asparagus. Good for you. How are the bees? An update, please. I didn’t peel for this soup either – most of the asparagus in the store isn’t fat enough to warrant it. I am on team “no peel”. However, I did pick up a bunch from my local co-op the other day that was as fat as could be and I did take the peeler to that bunch. I didn’t use cheesecloth either! I did exactly like you! I love the colour of your soup, beautiful! I’m so glad I’m not the only one! I’ve just never seen the point of peeling asparagus. I’m jealous of your asparagus patch. We planted asparagus a couple of years ago, but still haven’t gotten any to eat.